Anyone who has ridden a bicycle has noticed, leaning the spinning front wheel to the left causes the wheel to turn to the left. The more you lean the more it turns but once you stop leaning, the wheel no longer turns to the left. It is the change in lean which causes the wheel to turn not the absolute amount of lean. The turning of the wheel due to the leaning is called precession. If you were to hold a spinning bike wheel by it's axles up in the air, you could cause it to precess all the way around in a circle. Just like the gyroscope simulation. The big sphere is the equivalent of the bike wheel. The black and red balls at the end of the axle are our handholds on the bike axle and the yellow aluminum track both allows us to lean the axle and constrains it to rotate around on a flat surface. The faster we lean the axle, the faster it tries to precess. Uppercase the angular position gyro precession. Lowercase, the angular position of the axle/gyro about it's axis of rotation. Uppercase Omega, the angular velocity of precession = dΘ/dt = τ / L = τ / Iω. The precession direction changes depending on the direction of the applied torque relative to the direction of the spinning gyro. This is why the gyro seems to bounce back and forth if you do not rotate the tilt/torque with the gyro precession. Moment of Inertia of the gyro. The distance from the center of the gyro to the track. The radius of precession. The radius of the angle rotating in the track. Omega steady state = √(R/r * τ/I). When the precession velocity V = the gyro on track velocity v.
ω_ss is very important to all of this. ω_ss is when the gyro spin and precession are constant. Our math tells us they are constant when the tangential velocity of the axle equals the precession velocity due to the applied torque. Assuming this steady state of affairs, we can calculate the required torque to maintain steady state asLΩ = IωΩ. Since at steady state, ω~Ω, the required steady state torque goes up with the square of the speed. If the speed goes up by a factor of 2, the required torque goes up by a factor of 4. In other words, it gets really difficult really quickly. . This means the faster it goes, the harder the workout until you don't have enough strength to go any faster. To increase the speed of the gyro, you need to apply more than the steady state torque. This causes the precession velocity to be faster than the spin traverse velocity and the precession "winds up" the gyro. If you apply less than the steady state torque, the precession speed is less than the spin traverse velocity and the precession resists the gyro spin causing the gyro to slow down until they are again the same speed. Note: the torque only matters if applied in the right direction. If you are holding the track in your fingers and you rotate the track about the gyro axis as indicated in the diagram. Nothing will happen. You will just be rotating the track slightly relative to the gyro. 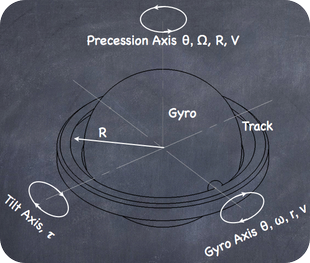 If you rotate the track about the precession axis, the gyro will stay stationary as the track rotates around the gyro. On tilts about the tilt axis as shown in the diagram will cause the gyro to precess. If you tilt somewhere between the tilt axis and gyro axis, the gyro will precess more than zero but less than if it was all tilt axis. Since the tilt axis precesses with the gyro. The direction in which you need to tilt rotates at the same rate as the precession. The simulation uses the real gyro in the iPhone or iPad to measure the direction of your tilt, compare it to the simulated gyro axis and applies a proportional torque depending on how close your tilt is to the simulated gyrotilt axis. Unfortunately this simulation can not give you a feel for the torque required to move the gyro. iPhones and iPads have no way to resist your motions other than with their own unchanging mass. Since the simulation can't really use your strength as a torque input, it uses the degree of tilt of the iPhone or iPad as the torque input to the gyro. In addition, since unlike a real gyro, it does not get harder to tilt the iPhone as the gyro speed increases, the simulation decreases the measured tilt as the speed increases.